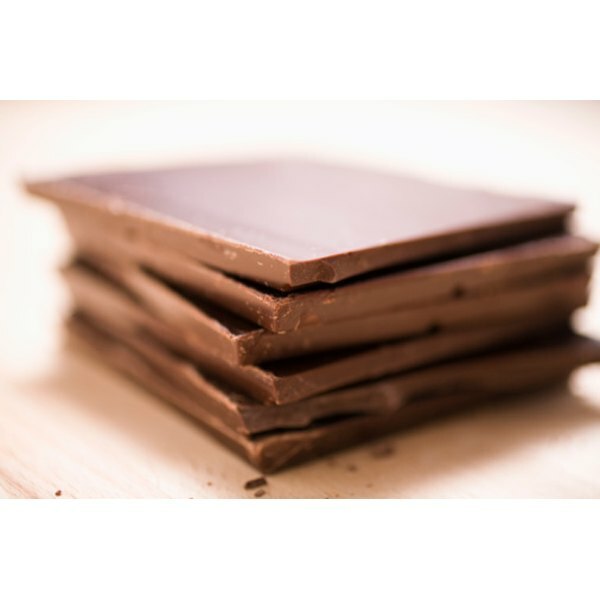 The majority of popular chocolates are high in calories, with around half from fat. Chocolate is made from cacao seeds, which grow in large pods on cacao trees. Cacao trees are native to Central and South America, but are now grown globally to meet the demand for cacao and chocolate products. The first known use of cacao seeds was more than 2,000 years ago when the Mayan and Aztecs made a spicy beverage using ground cacao seeds and various spices. Europe was introduced to the cacao seeds by the Spanish conquistadors and a variety of beverages and chocolate products were developed over time. Today, chocolate is an international sweet treat and there are countless types and flavors. Nine individually wrapped Hershey’s Milk Chocolate Kisses contain 230 calories. Of the 230 total calories, 120 calories come from fat. A little less than 100 calories come from carbohydrates and the remaining 12 calories are from protein. Based on a 2,000 calorie diet, nine Hershey’s Kisses yield 20 percent of the daily recommended intake for total fat and 40 percent of the daily recommended maximum intake for saturated fat. A single Cadbury Dairy Milk Treatsize Bar contains 80 calories. Slightly more than half of the total calories, 40.5 calories, are from the fat content. Around 35 calories are from carbohydrates and the remaining 4.5 calories are from protein. One Cadbury Treatsize Bar contains about 6.5 percent of the total daily recommended intake for fat and 14 percent of the recommended maximum intake for saturated fat. A handful, or five pieces, of Dove Silky Smooth Milk Chocolate Promises contain 220 calories. Exactly half, or 110 calories, are from fat. Carbohydrates account for 95 calories, while protein accounts for 15 calories. Five Dove Silky Smooth Milk Chocolate Promises yield 13 g of total fat, including 8 g of saturated fat. One Ghirardelli Milk Chocolate Square with Caramel Filling contains 52 calories. Around half of the total calories, 25 calories, are from fat. A little less than 25 calories come from carbohydrates and around 3 calories come from protein. One square contains less than 10 percent of the daily recommended intake for total fat and saturated fat. A single package, containing three individually wrapped Ferrero Rocher Hazelnut Chocolates has a total of 220 calories. Of those 220 calories, 140 calories are from fat. Carbohydrates account for 66 calories, while protein accounts for 14 calories. Three Ferrero Rocher Hazelnut Chocolates contain nearly 25 percent of the daily recommended intake for fat and 25 percent of the daily recommended maximum intake for saturated fat.